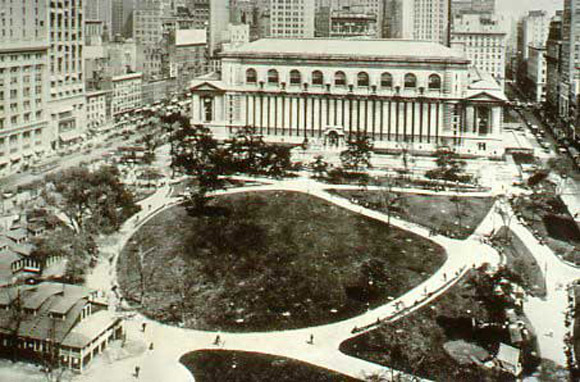 New York City parks are home to many World War I memorials and monuments, including the plaque dedicated to former NYC Mayor John Purroy Mitchell on the front terrace of the NYPL, near Bryant Park, and also the location of free fencing classes taught by experts from the Manhattan Fencing Center, starting today at 1:00 pm. The park itself was the location of the first New York City Y.M.C.A. Eagle Hut. First built in London, the huts were constructed to provide a home away from home to soldiers and military personnel. 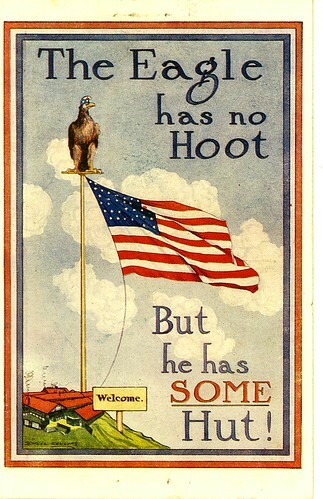 This image, courtesy of the Woodrow Wilson Presidential Library (WWPL) flickr page, is identified as signage for the Eagle Hut in London. Click on the photo for more information, and to check out their vast digital photo archive. 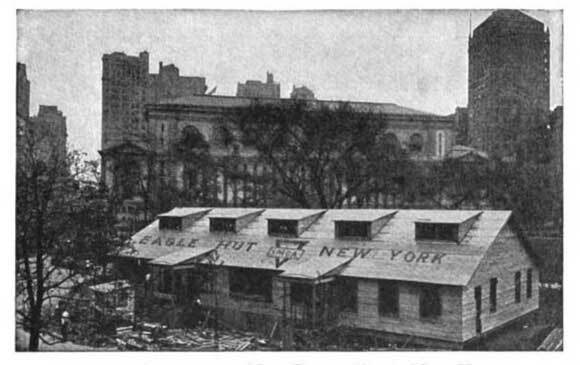 The Bryant Park Eagle Hut was based on the London Eagle Hut, which opened on September 3, 1917. Similar in structure and services provided, the Bryant Park Eagle Hut was dedicated and opened in 1918, and stood in the northwest section of the park, about where Heiskell Plaza is now. Read the whole thing here, and see one of the early published copies of Blake's Songs of Innocence and Experience here. The Y.M.C.A's goal was to provide the men with resources, Bible study, and a sense of community in their new environment. The United States Y.M.C.A was founded on December 12, 1851 by retired sea Captain Thomas Valentine Sullivan to provide the same types of services to sailors and merchants in Boston. 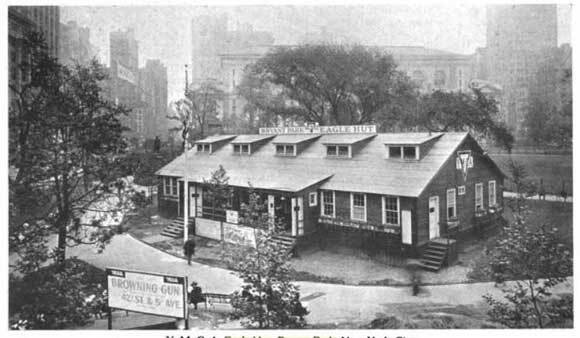 Similarly, the Eagle Huts in London, Bryant Park, and gradually other locations, including a "Victory Hut" erected in New York City's Battery Park in 1919, provided out-of-town servicemen with a broad range of services and activities, including free circulating libraries, meals, movies, socials, and events; and convenience services like mending, check-cashing, post and parcel services, and discounted sight-seeing trips. Duties were mostly carried out by female volunteers, and headed by committees of the same. 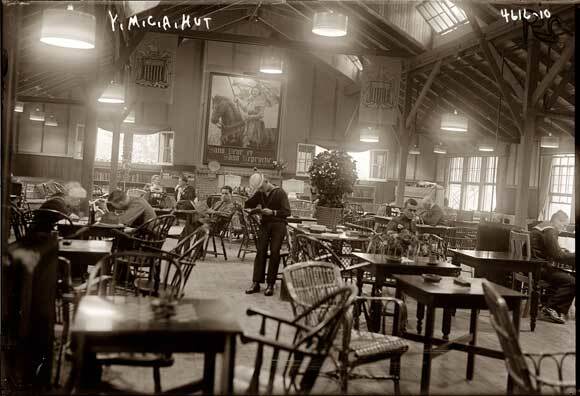 The huts also served as gathering places (much like parks do) for relaxation or just hanging out, as seen here in this photo of the inside of the Bryant Park Eagle Hut, taken June 12, 1918. At some point, the Bryant Park Eagle Hut proved so popular, that two additional wings were added. You can sort of see them in the lower left corner of the picture below, taken around 1920. It was most likely torn down to make way for construction of the Flushing line subway, which began in 1922 and lasted through most of the decade.